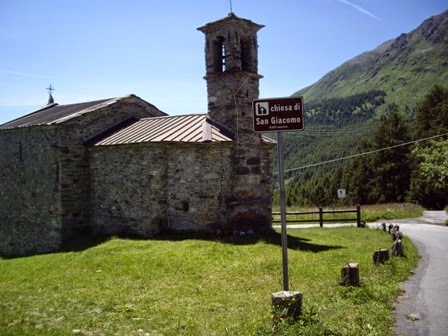 chiesa di San Giacomo, near the top of the climb from Edolo. While it took me almost half a day of busting my guts to build my endorphin level to an all-time high, it only needed a few seconds for it all to be replaced by maudlin self-doubt......Extract from my book, Lycra, Lattes and the Long Way Round. Finally, a beautiful day dawned after non-stop rain for the previous 24 hours. Only in Temù for one more day, it would be our last opportunity to visit the Passo del Mortirolo, another of the Giro d’ Italia’s fabled climbs. 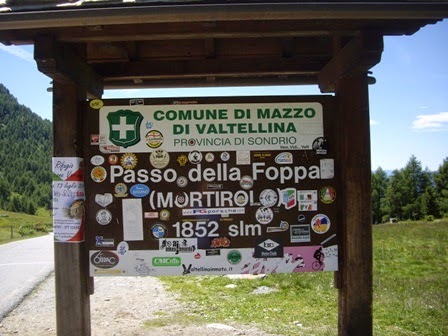 Less widely known in cycling terms as the Passo della Foppa, it connects Mazzo di Valtellina (in the province of Sondrio) and the Val Camonica (Brescia). A dwarf by comparison to its northern cousins Stelvio and Gavia, Mortirolo is nevertheless one of the most excruciatingly tough climbs you could ever ride. Like other iconic mountain passes, among them Mont Ventoux, Passo dello Stelvio and Monte Zoncolan, the summit is the meeting point of three distinct routes; from Grosio (14.8kms at 8.3%), Edolo (17.2kms at 6.7%) and, the climb that gives the pass its reputation, Mazzo di Valtellina, (12.5kms at a punishing 10.5%). Climbing the pass from the turn off along the SS42 towards Monno was by far the least difficult of all three ascents. The ride is at its steepest between kilometres 7 and 13, plus an additional two tough kilometres (of almost 10%) not far from the summit. But unlike Mortirolo’s signature route, the terrain is more sympathetic along the way, offering the rider a little respite; and even better, just when you need it most, a 500 metre stretch of near-flat road underneath a canopy of trees. Despite the steepness of the remaining 2.5 kilometres, I was soon relaxing below the summit enjoying the view down the valley I’d just climbed. Once over the rise, past the sign that read ‘Passo della Foppa’, I contemplated the view the other way, towards Mazzo di Valtellina. Not much wider than a goat track and heavily forested, save for the few hundred metres in front of me, it seemed a huge departure from the snow-capped skyscrapers I was in awe over just days earlier. Even at a height of 1,852 metres, it felt like a Mediterranean climate compared with the freezing temperatures further north. A bit like the routes up Monte Zoncolan - from Sutrio and Priola - the roads from the remaining two climbs intersect just a few kilometres from the summit. But, even at an average of just below 9%, it’s not the lung-busting curse of double-figure gradients and 22% maximums, that even the Giro d’ Italia tends to avoid. 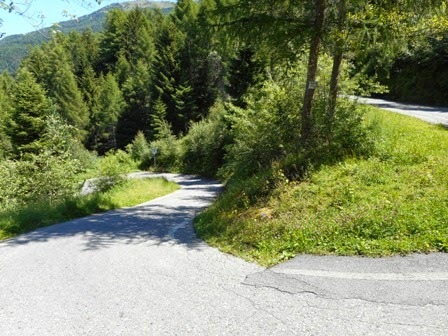 To be honest, there’s not much I remember about my climb up Mortirolo from Mazzo, save for the 27 times I raised my head to count each of the hairpins I passed. While only a short distance to get around, how I longed for the slightly less steep gradient afforded by each one. The seven kilometres between San Matè and the intersection with the road up from Grosio, was by far the most unpleasant. 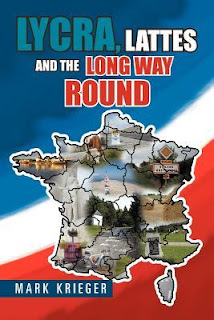 It’s here, you’re virtually surrounded by thick forest, on all sides, save for the narrow bitumen escape route in front of you. Averaging between 11 and 18%, it’s not until you reach the top of this stairway that the views towards Valtellina, some 900 metres below, are unlocked. At Piaz, around what is presumably the steepest bend on the entire climb, is a striking monument to Italian cycling legend, Marco Pantani. 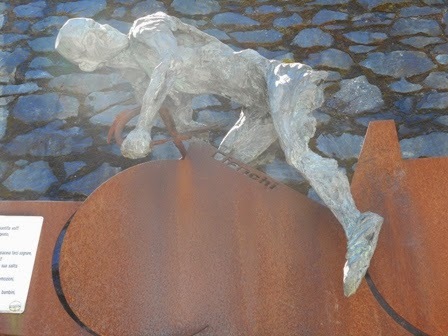 The sculpture, standing high above on a wall, depicts the champion rider’s dynamic ascent up the pass on his way to winning stage 15 in the 1994 Giro d’ Italia. One of the 27 hairpins on the way up Mortirollo, from Mazzo. Soon at the summit - for a second time - I met Roz who had herself, walked a few kilometres up the road. 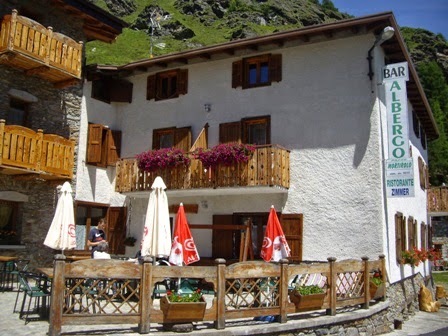 We ate lunch at the Albergo Passo Mortirolo, though rather surprisingly, especially given the beautiful afternoon, there were few people to join us; and even less at the summit itself. 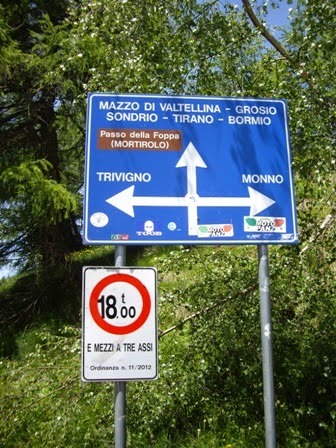 Despite its superior gradient and patriotic following along its steep slopes during the Giro d’ Italia, Mortirolo doesn’t otherwise appear to command the same popularity as either Gavia or Stelvio. Judging from our own brief experiences, cyclists and tourists alike come to the Alpine cousins in their droves; when of course, the fickle weather permits them to. That’s not to say we didn’t enjoy our time at Mortirolo’s summit. Its sense of solitude and natural beauty left us with the distinct feeling that it’s a far purer climb, and place to be, than many of its commercial counterparts. on the steepest of hairpins up Mortirolo. My hunger satisfied, though not my desire to climb Mortirolo from all three sides, I set off down the pass again, this time towards Grosio. Another steep climb, its first three kilometres have an average gradient of almost 11%. While significantly steeper than the route from Edolo, it too has some brief sections along the climb that make the going a little easier; that’s if you think a third climb up a steep pass in one day has anything easy going for it in the first place. On yet another narrow road, I’d hardly seen a car along more than 60 kilometres of bitumen. That was until half way up the climb, when I encountered a large truck coming the other way. With size and gravity on his side, the driver didn’t seem too concerned about the limited space there was for each vehicle – his truck and me on my bike – to pass each other safely. 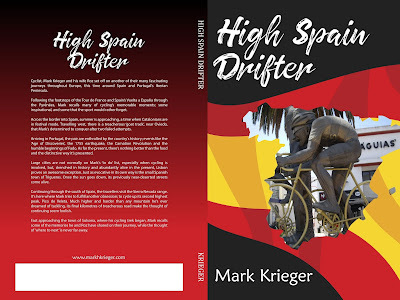 Travelling at my seven kilometre per hour speed up what felt like a 16% gradient, I began nodding my head in appreciation that he, though still at least 20 metres away, would slow down and keep as much to the right side of the road as humanly possible. With a hope and a prayer we parted company with a just sliver between us. Fortunately, that was the last moving object I encountered until I reached the far busier SS42, which carried me back to our last night’s stay in Temù. Though I had a long ride and some considerable climbing ahead of me the next day, it was the furthest thing from my mind. I’d climbed Mortirolo, not only from its hardest side but all three sides. I couldn’t wait until I got home to tell my mate Lore that unlike Ventoux, the first time, I’d completed the trifecta, all in one day no less. That was until I checked the Climbbybike.com website. “But Lore, what about Meat Loaf ’s song, Two Out’a Three Ain’t Bad?” I retorted, trying to put a positive spin on my rapidly declining day. “Yeah, but when’s the last time he made a hit record?” Lore deadpanned. I don’t remember much more of the conversation, only that I wished I’d rung someone else . . . in fact, anybody else. Climbing Ventoux was meant to be one of the highlights, if not “the” highlight of the trip. It took me the next five weeks to get Lore’s words out of my mind. Bonnie Tyler was gone, while Meat Loaf was now indelibly etched in my troubled psyche. My negative thoughts of Ventoux have all but disappeared, only to be replaced by bloody 'Tovo', the 4th way up Mortirolo's wonderful mountain pass! 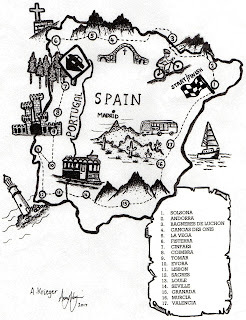 But who knows, like its French counterpart from Provence, I might just get back there one day.